Help a child keep their play area organized with Whitmor's 12-Bin Organizer, in primary colors. 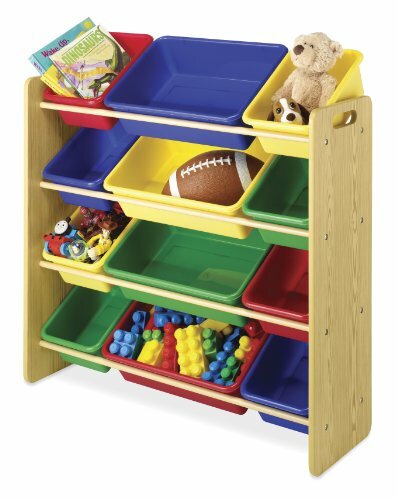 This four-tiered toy organizer provides eight small toy bins and four double-size toy bins for storing a variety of toys, craft items, small stuffed animals and more. The bins fit between two rods, facing out to allow toddlers to see, retrieve and replace toys with ease. Each tier has room for two large bins, or one large bin and two small bins, or four small bins. The toy organizer requires some assembly and cleans easily with a damp cloth and mild soap. The assembled toy organizer measures 33.88" x 12.25" x 35-1/4". Whitmor is a 4th generation family-owned and operated business. Since 1946, Whitmor has been dedicated to bringing organization home by creating products that simplify everyday life. Ensuring that those products are built with integrity, value, and innovation is our commitment to you. And our promise is that we will always be here for you should you ever need us as we stand behind our product 100%. Whitmor customer service is available in English and Spanish Monday through Friday from 8am - 4:30pm CST. Call us and we will gladly assist you in your language. You may contact Whitmor toll-free at 1-888-944-8667 or via email at customer_service@whitmor.com. View More In Bookcases, Cabinets & Shelves. If you have any questions about this product by Whitmor, contact us by completing and submitting the form below. If you are looking for a specif part number, please include it with your message.